Who can resist America’s favorite pastime—Baseball?! It’s come quite a long way from hitting a ball with a stick in an alley. Baseball today is far from your great-grandfather’s baseball. Instead of an unorganized activity for fun after school, it’s become the Major Leagues, Homeruns, Stadium Hot Dogs, and Bob Uecker. This is the story of the World Series and how it got be the way it is now. Way back when—and when I say way back, I’m talking 1870’s—there was only one league: the National Association of Professional Base Ball Players (who soon changed their name to the National League). 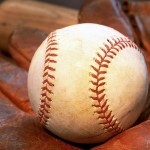 They were the top dogs until 1882 when a second major league was formed—the American Association. Up until that point the championship simply went to the team with the best record at the end of the season. But with the American Association now in the picture, the two leagues decided to face each other in a series of games to see who would win the championship. These championship series are essentially what evolved into the World Series, however, they weren’t nearly as organized or official as the World Series we know today. Some series only lasted three games. Others lasted fifteen. And some even ended in ties! The games were advertised as “The Championship of the United States” or the “World’s Championship Series,” which birthed the shorthand “World’s Series.” Up until 1930, people considered Baseball’s Championships to have started in 1884 near the rise of the American Association; however, nowadays the World Series isn’t considered to have started until 1903. Last year, the San Francisco Giants took the World Series after defeating the Detroit Tigers. Who will take the Series this year is anyone’s guess. Keep watching and remember to root, root, root for the home team! Till next time, Ball Fans!